The Pro-Patch Pothole Patcher by H.D. 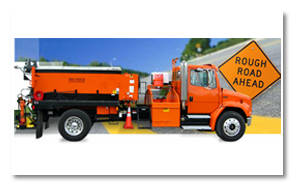 Industries is an asphalt patching machine capable of making effective and permanent asphalt repairs under all weather conditions. Its unique design allows the machine to transport hot or cold asphalt pre-mix material and road oils at controlled heated temperatures. Units are available in 3 cy, 4.25 cy, 5 cy or 6 cy asphalt hoppers in truck chassis or trailer mounted versions. Truck mounted units give you the choice between a heat transfer oil system, dry radiant heat system, or all electric system. The Pro-Patch, when properly utilized, will reduce the cost and increase the efficiency in street maintenance programs with 100 percent payback.